The Dublin rental property situation is desperate, with population growing but little being built. Here is a simple first step to provide immediate relief, through a change in the tax code. It could be in place before the end of July if there is the political will. 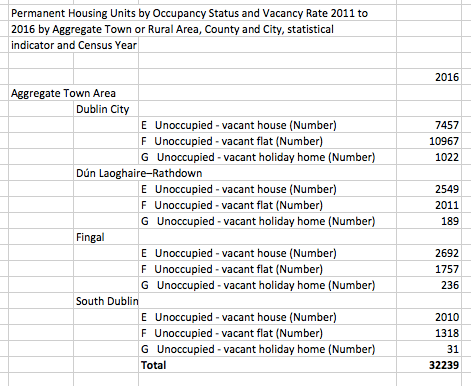 Despite the crisis, there are reckoned to be 20,000 vacant homes in Dublin alone. If these could be brought onto the rental market, it would make an immediate difference to the housing problem. UPDATE: latest statistics from CSO for vacant homes in Dublin counties for 2016 are now provided below. There are said to be over 32000 properties vacant. Firstly, put a tax on any property in a ‘rent pressure zone’ that is neither a principal private residence nor a registered rental property. ‘Rent pressure zones‘ are areas that the government has legally determined, after an investigation, to have an acute shortage of rental accommodation. ‘Principal private residence‘ is a technical term in Irish tax law. It is the place where you live, and if you own it you benefit from certain tax advantages. Rental properties (well, strictly speaking rental tenancies) have to be registered with the RTB. There are databases of all these properties in place now, so it is easy enough to cross-reference and find properties which would be subject to this tax. There would have to be various exemptions for special cases. The special tax would be set at somewhere between 0.5 percent and 2 percent of the property value, which has already been declared for purposes of the local property tax. The rate might go up over a couple of years. If I were the Minister for Finance, I would seriously consider bringing forward an emergency budget to implement this measure to apply for the second half of the 2017 tax year. Secondly, provide incentives to get these same properties rented as quickly as possible. There are already incentives in place to refurbish vacant accommodation to rent to local authorities and there is an opportunity to extend these to apply to private sector rentals. An immediate loan or grant could be given, for example, for every new rental property brought onto the market and this loan or grant would be recouped through tax on rents over three or four years. Alternatively, these properties could also be exempted from the minimum standards for rental accommodation for the first year, in order to ensure a quick start. Together these measures would provide a strong incentive to get vacant accommodation rented out before year-end. 5000 to 10000 vacant homes could be brought into the rental sector within months in Dublin and this would make an immediate difference in the market. There is one obvious problem with this idea – the standard of the rental properties it would bring to market at the outset would be relatively low. But it would get the rental market moving again for the short term. With rents at the current tremendous levels, many good tenants would be glad to have a permanent roof over their heads, even if the home they got was not in particularly good condition. And the standards could be improved over time, as availability improved and as cash began to flow. Straightforward, effective, simple. Difficult to see any major downside.